Peter of Omega Fanatic sent me this picture of an Omega Globemaster along with a fascinating story on its history that he obtained from Jean-Luc Miranda of the Omega Museum. According to Jean-Luc, Globemaster was the name chosen by Omega to market the first models of its Constellation line in the United States. Miranda says that another corporation owned the Constellation name in the U.S. and Omega was prevented from using the trademark. There is another story, however, that the Globemaster name had to be withdrawn from the US because of a copyright dispute and the watch was re-named Constellation. Which one is true? Some more detective work is required before we arrive at a definitive conclusion. If the Omega Museum is correct, and one could argue it should be, then Omega must have ultimately purchased or obtained the rights to name its watches as Constellations, but not before a number of Globemaster models were released in the U.S. over some years. Globemaster was the name of the predecessor to the massive transport planes operated by the US military. The Douglas C-124 was a two level giant powered by four propellor engines. The plane could hold 200 troops or 127 litter patients and could also hold vehicles as large as tanks. A total of 449 Globemasters were built between 1949 to 1955. The aircraft served the USAF until 1970 and the reserves until 1974. The calibre of the movement in the example above is 491 and the 33mm case is numbered 3630037, the same case that was also used in Omega Century models. I have also seen a Globemaster with double stick markers powered by a calibre 501 movement with a case number D76973. Another example I've seen has very similar arrowhead markers in gold as in the picture shown above. The case was identical to that which housed the early classic Constellations. It was numbered 3743524 and had a Star Watch Case Company logo stamped on the back. It was common in the US at the time for watches to be cased there to avoid high tariffs imposed to protect its own watch industry. 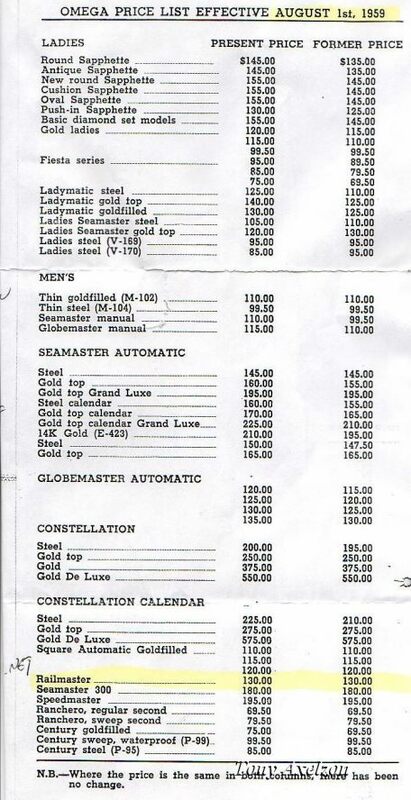 Thanks to Gatorcpa, a TimeZone contributor, we have some more information on Globemasters. He referred to a previous discussion on the topic and mentioned a post by FrankN a respected Omega sage, who said "The Globemaster name is the original concept name for what eventually became the Constellation, but it never appeared on the dials of any watch, that came out of Bienne." FrankN believes that the Omega importer in the US at the time, Norman Morris, made up the name Globemaster. Gatorcpa says that it was a USA model with a USA made case and that, " There is some evidence to suggest that the Constellation was not immediately introduced to the USA in 1952. Whether this was due to copyright concerns or other competitive reasons, is not clear." He confirmed that as early as 1959 both models were being sold in the USA, adding, " Based on what I've seen, it is possible that only the Globemaster was sold here at the beginning (say pre-1954) and at some point the Constellation was introduced above it. I know I've seen mid-50's Constellations with the adjusted chronometer movements (501/505)"
Gatorcpa and I embarked on a simultaneous search of the net and came up with scans of different ads of the time. Using the ads as evidence of the presence of Globemasters, a National Geographic advertisement from a 1954 issue confirms that they were being marketed at that time. Gatorcpa makes the observation on some scans he unearthed, "Note that these Globemasters have the arrowhead hour markers. I've never seen an arrowhead example on the internet or anywhere else, until now. I suspect most of them have been re-dialed as Constellations and sold for big bucks on eBay at some point." But the clincher, he says, has to do with spelling. " I always wondered why the early Constellations had the British spelling of the word Chronometre. Now I realize it is because none of the early Constellations were sold by Omega in the USA. Instead, Omega cased the identical movements here and called it the Globemaster. At some point (1956?-60), the issues were settled, and both watches were sold here, with the Globemaster taking a step down." Jean-Luc Miranda's version of events is standing up well to scrutiny. The presence of advertising for Globemasters as early as 1954, coupled with the absence of similar advertising for Constellations (Constellation was launched in Europe in 1952) supports his version of events and somewhat discounts the version of events that has Globemaster being withdrawn owing to a trademark dispute. price list on Chuck Maddox's site showing Globemasters being retailed at between 120 and 135 dollars and Constellations priced between 200 and 550 dollars. Some original Globemasters were certified chronometers and often have different case markings and manufacturers stamps, indicating that Norman Morris was indeed casing globemasters as early as 1954. Other Globemasters, however, were not certified chronometers and this adds a tad more confusion to our story. For example, our pictured example is not a certified chronometer as far as I can ascertain and the later added post above of a calibre 501 isn't either, although the example above with the double-stick markers has a Swan Neck regulator, but no stamping for adjustment to five temperatures and positions. Bill Sohne, another Timezone 'Lifer' helps us gain even more clarity. He says that the Omega Constellation launch in the U.S. was delayed by a trademark issue with Lockheed. Bill adds, "Lockheed produced the Constellation plane in the 1940s and then produced the Super Connie into the late 1950s. Keep in mind that TWA had exclusive rights to the plane for a period of time and would market it as such to the public, so seeing ads for a Connie watch and a Connie plane could muddy up the marketing waters." Bill also confirms that most Omegas were cased in the U.S. in the fifties. The Norman Morris habit ( NM was the exclusive U.S. distributor for Omega) of inventing its own models and styles was due to the latitude the company had in deciding how to present the Omega line in the U.S. Hence, he says, "You see Globmasters with non-chronometre configurations, whereas all Connies outside of the US were chronometre grade watches - at least during the early years 1952 - 1970. There are a lot of 'unique' US market Omega watches, cases and bracelets that came out of the collective imagination of Norman Morris Inc."
So, with some serious input from generous Timezoners I think we have as close to the definitive story as we may get, given the effluction of so much time, the resulting memory loss, and the fact that Omega's records are far from complete. My thanks to all.